Amanda is a Professor at the Institute for the Oceans and Fisheries at the University of British Columbia, Canada. She also leads a marine conservation team called Project Seahorse (www.projectseahorse.org), that blends research with management and policy action. Their work includes ecological and social research, marine protected areas, fisheries and trade management, and development of integrated policy. Although primarily focused on Asia, Project Seahorse is active around the world, using the charisma of seahorses to advance broad marine conservation solutions. One big focus must be on ending annihilation fishing, where any and all forms of life are taken indiscriminately. Along with other international roles, Amanda is Chair of the IUCN global committee that links ventures for conservation of marine species. Diva Amon is a Trinidadian deep-sea biologist who studies the weird and wonderful animals living in the deep ocean and how our actions are impacting them. She is currently undertaking a Marie Skłodowska-Curie research fellowship at the Natural History Museum in London, UK. Diva has participated in deep-sea expeditions around the world and has also done a considerable amount of science communication and public engagement. Additionally, Diva is a founder and director of the non-profit NGO, SpeSeas, dedicated to marine science, education and advocacy in Trinidad and Tobago and the wider Caribbean. Doug Cress is the Chief Executive Officer of the World Association of Zoos and Aquariums (WAZA). Cress previously spent six years (2011-2016) as a Programme Coordinator for the United Nations Environment Programme (UNEP) in Nairobi, Kenya. His portfolio included the Great Apes Survival Partnership (GRASP), a coalition of 105 national governments, conservation organizations, research institutions, zoos, and UN agencies that aims to protect apes and their habitat in Africa and Asia. Cress also worked on issues such as illegal wildlife trade, sustainable development, protected area management, and climate change. Matthew Gollock is the Marine and Freshwater Programme Manager at ZSL, and has over 20 years’ experience researching and conserving aquatic species. He is interested in migratory species - particularly elasmobranchs and anguillid eels – and the management and policy mechanisms required to conserve their unique life histories. He is the Chair of the Anguillid Eel Specialist Group. Jean Harris directs WILDOCEANS, the marine programme of the WILDTRUST, a non-governmental public interest organisation based in South Africa. Prior to this she led the scientific services team of Ezemvelo KZN Wildlife, the conservation agency which manages the protected areas and biodiversity in the eastern province of South Africa. Jean has served on the Scientific Authority that advises the South African Minister of Environment on biodiversity matters, as well as the Marine Science for Management Programme Committee of the Western Indian Ocean Marine Science Association (WIOMSA). Her current initiatives include the Ocean Stewards Programme which aims to build offshore marine science capacity and inspire a new generation of ocean advocates. She is a core team member for three offshore projects funded through the African Coelacanth Ecosystem Programme (ACEP), that are conducting research in support of marine protected area expansion. Jean is also the skipper of RY Angra Pequena, the 72 ft research and training vessel. Rima is a conservationist and fisheries scientist with experience spanning the northwest Indian Ocean and more recently West Africa. Her research has focused on investigating shark and ray fisheries and trade and combines field work with outreach and advocacy to mobilize and provide conservation and policy solutions at the government and community levels. Rima is also the Indian Ocean Regional Vice-Chair of the IUCN Shark Specialist Group and sits on the Advisory Committee for the Convention on Migratory Species (CMS) Sharks MoU as a representative of the Asia region. Dan is a well-respected world leader on Marine Protected Areas and ocean conservation. Scientist, communicator, explorer and conservationist, at IUCN he is Marine Vice Chair for IUCN World Commission on Protected Areas, and Senior Advisor on Marine Science and Conservation in the Global Marine and Polar Programme. For over 30 years Dan has been responsible for the creation of many global, European and UK public and private sector partnerships, alliances and frameworks that underpin modern-day marine conservation. This work includes creating the concept of Blue Carbon, global conservation standards for MPAs, creating global IT infrastructure engaging with the ocean (e.g. Google Earth and Maps), successful scaling up action on ocean warming, acidification and deoxygenation, successful scaling -up work on marine World Heritage and conservation of the High Seas, creation and implementation of Sylvia Earle’s Hope Spots initiative, and various recognised global guidance on implementing Marine Protected Areas and Marine Spatial Planning. Joe is an ecosystem ecologist specialising the role of animals and anthropogenic influences in the processes sustaining coastal wetlands. 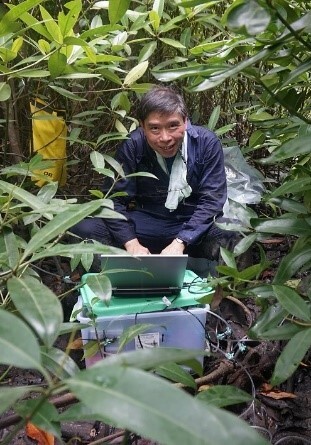 His PhD thesis was on the conservation and management of the Mai Po Marshes, an internationally important Ramsar in Hong Kong. He has since worked in various wetland systems of the world, particularly the mangrove forests in Southeast Asia and Australia. Joe is currently a Professor and the Director of the Simon F S Li Marine Science Laboratory of The Chinese University of Hong Kong. He was the founding co-chair and current chair of the IUCN Mangrove Specialist Group. Aaron is a marine conservation practitioner interested in the sea was ironically driven by his love for seafood. His work has largely focused on understanding the costs of seafood production on vulnerable marine species and livelihoods and finding ways to make the seafood system more sustainable through policy and practice. His work involves designing, supporting and implementing projects which include understanding the impacts of tropical trawl fisheries, managing marine protected areas and setting up fisheries monitoring programmes in South Asia and West Africa. He has worked for GIZ (Indo-German Biodiversity Programme) and is also a member of the IUCN SSC Sea snake specialist group. Liu Min is a Professor in Marine Biology at the College of Ocean and Earth Sciences, Xiamen University in China. Her principal research interests include the reproductive biology and sexual pattern of marine fish species, diversity and conservation of marine fishes in China, fisheries resources assessment and management, and sea turtles conservation. Gianna Minton started her career in the field of education, but became so inspired by Oman’s marine environment during her 8 years there, that she started a new career in marine mammal research and conservation. Gianna has a PhD focusing on the unique non-migratory humpback whales of the Arabian Sea, and has conducted field-based cetacean research in Oman, Malaysia and Gabon. A member of the IUCN Cetacean Specialist Group, she has also worked on turtle and fisheries monitoring, and is now based in the Netherlands, working on cetacean conservation with WWF, the IWC and the IUCN. Dr. Beth Polidoro is an Associate Professor of Marine Conservation and Environmental Chemistry at Arizona State University (ASU). She has more than 15 years experience with IUCN, primarily working on Red List Assessments for marine species. She currently leads the ASU-IUCN Red List Partnership commitments, as well as helps to coordinate IUCN Red List Assessments for a number of marine groups, including bony fishes and reef-building corals.